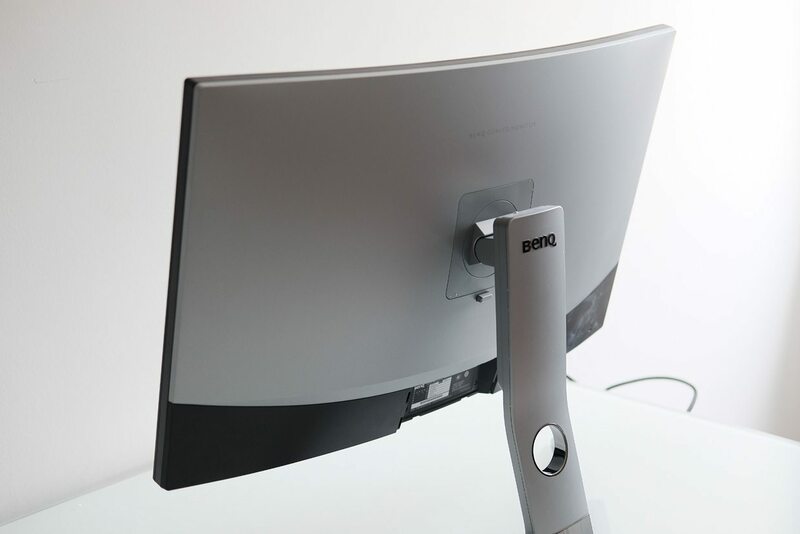 This 1080p gaming monitor from BenQ has it all: a 31.5-inch display with 1800R curvature, a high refresh rate of 144Hz and a VA panel that boasts high contrast, good colour accuracy and decent viewing angles too. It’s not the highest resolution panel in the world, but that makes it a lot easier to hit its high refresh rate. It’s a strong set of specs, but how does it perform in the real world? Let’s put it to the test! The EX3200R is a stylish monitor with medium-size bezels and a noticeably curved display. The curvature provides a more immersive experience, fitting the screen more easily into your peripheral vision, and in turn making it a little worse for multiple viewers. This is nice for films, but really shines in games from a first-person viewpoint, like shooters, racing games or simulations. The high refresh rate, 144Hz, also benefits these games, making for a convincing combination. 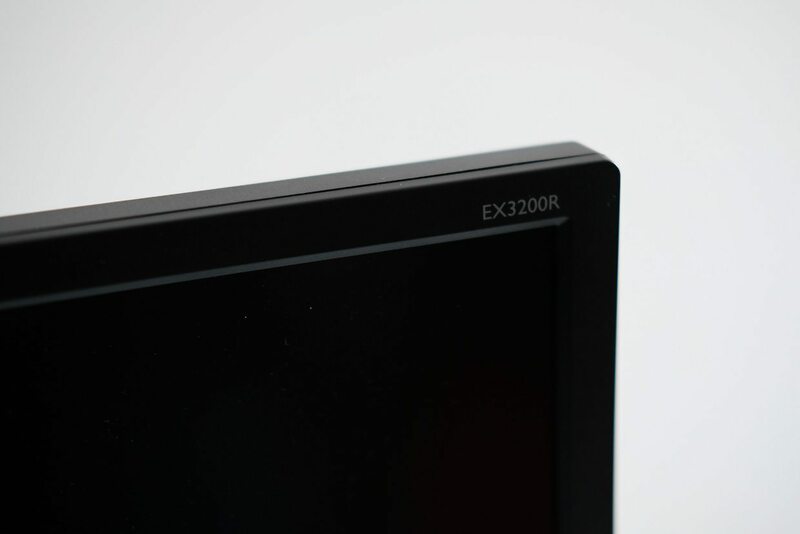 Unlike most other curved monitors, the EX3200R has a traditional 16:9 aspect ratio instead of a cinematic 21:9. That means a bit less desktop real estate, but it fits more conveniently on desks and it’s easier on your GPU too. It also means that you don’t need to seek out special 21:9 content; anything made for TV will fit your monitor just fine. 21:9 support is also missing in many games, even recent titles, so you avoid that particular pitfall too. The matte black bezel around the EX3200R is nothing special in terms of looks, but the shiny triangular metal stand provides a touch of class and modernity. 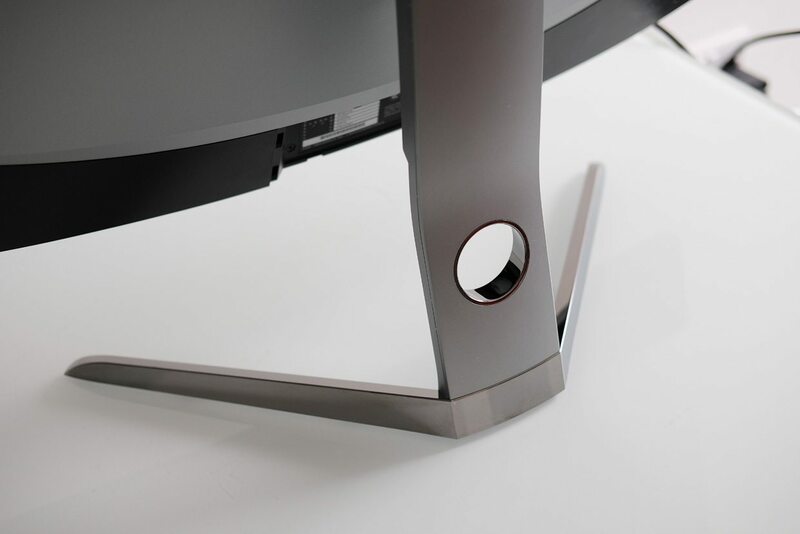 This stand can be tilted up or down, but no other adjustability is possible (although it’s not likely you’d want to use this monitor in portrait mode!). The back of the monitor has a nice subtle texture to it, and the three video input ports are downward facing in the centre. These are quite annoying to access without leaning over the monitor awkwardly; for that reason alone I’d recommend using a full-size DisplayPort connection rather than a harder-to-connect Mini DisplayPort cable; HDMI is also available but lacks support for the high refresh rate. I’d much rather see side-mounted ports on a monitor this size, but it’s a minor quibble at best. All in all, it’s a good-looking monitor that escapes the traditional red-LED-infused gamer look for something altogether classier. The design choices make sense, and I’m looking forward to testing. I used the EX3200R as our main monitor for gaming, image editing and writing for a period of two weeks. I’ll go into the benchmarks later, but for now I’ll share my impressions. For games, the EX3200R is a winner. The strong contrast levels of the VA panel are great for games set in inky blackness, and the curvature really adds to the immersion. 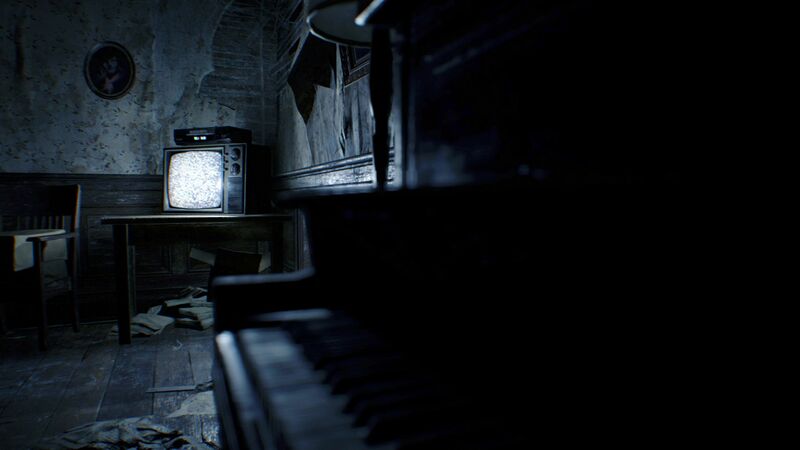 I played Resident Evil 7 and got thoroughly frightened while trudging through that dark and fetid house of horrors. However, in quieter sections I did notice the screen looked quite grainy, due to the low pixel density. That makes the game easier to render, but if you have the horsepower to spare then a 1440p or 4K monitor will provide a considerable upgrade to visual fidelity. It was a similar story with work tasks. The 1080p resolution feels a little confining when keeping multiple windows on screen at once, particularly if you’re used to higher resolutions. Normally on a curved display you get the benefit of that extra horizontal resolution, but of course that isn’t a factor here due to the standard 16:9 aspect ratio. In addition, the curved screen looks a little weird for web pages and particularly spreadsheets. You can get used to that, though. Another point of contention was the on screen-display (the OSD) and its seven buttons. These are mounted on the bottom of the monitor, and fairly close to the middle of the monitor. 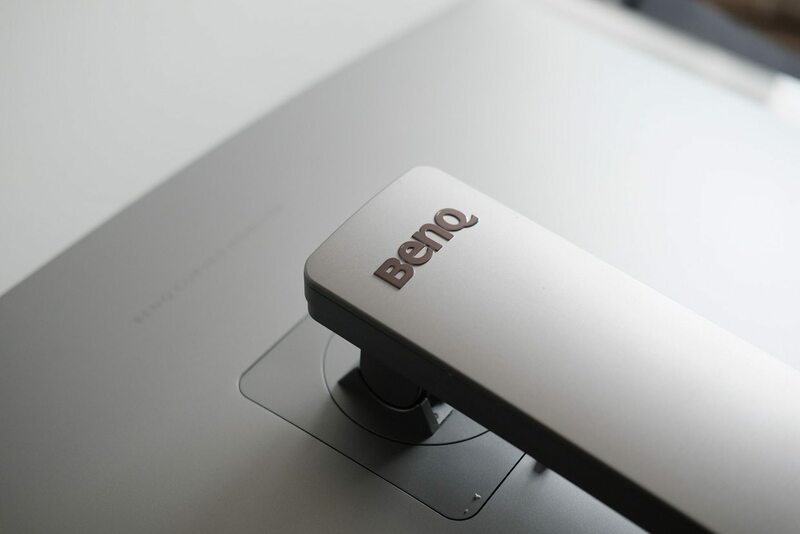 I consistently found myself reaching to change the brightness or mode, and ending up hitting the power switch or the change inputs button, both of which turned off the monitor for a good ten seconds at a time — frustrating. The legends on the front of the monitor could certainly stand to be more noticeable to fix this problem, but front-mounted buttons are the better solution. I performed our benchmarks with a Spyder4Elite*. As usual, we will calibrate the display to gamma 2.2, white point 6500k and 120 nits of brightness before doing our tests. *I’ll be upgrading to an X-Rite i1Display Pro when our budget allows; this is all we have at the moment so please be understanding. I’ll start with a look at the monitor’s colour gamut, which shows 95% sRGB (on standard mode), 72% NTSC and 74% AdobeRGB. That’s perfectly fine for a monitor that isn’t designed for critical image or video work, but it should slightly negatively influence our colour accuracy tests later on in this section. Next comes a few measurements, showing how close the monitor was to calibrated out of the box. We can see very low Delta-E (error) values for white point and 50% gray. Out of the box, contrast ratios were decent, but after calibration black levels were very low — awesome. Next we’re looking at the display’s gamma curves. These are given as ‘gamma 1’, ‘gamma 2’, etc., so this shows what gamma levels they actually correspond to. 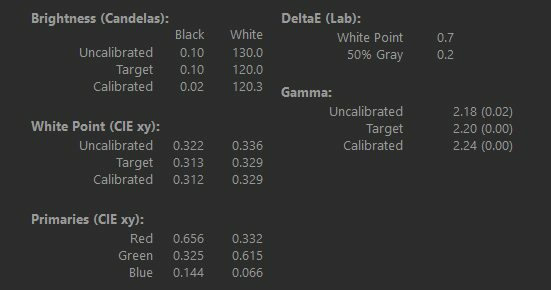 Gamma 3 is our preferred setting of gamma 2.2; you can see the full results below. Note that the curves are almost all perfect, off only by 0.01 at most. 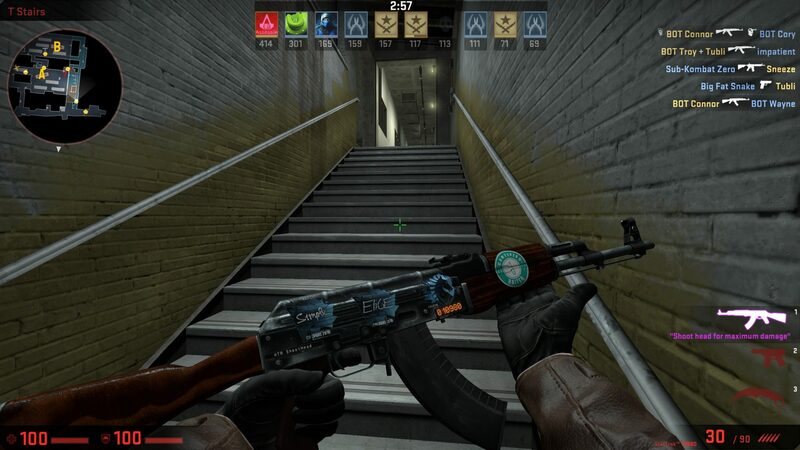 This is the grey ramp for our chosen gamma setting; it’s a little off but not ridiculously so. Colour uniformity comes next. We can see quite poor results in the upper corners, which is quite disappointing. However, the rest of the screen seems pretty good. Next up is the luminance uniformity test, which shows much better results with a maximum variance of about 10% in the upper centre quadrant, which is dimmer than its neighbours. Colour accuracy is not going to be perfect thanks to that missing slice of sRGB, and we can see that represented in the teal 1F outlier below. However, elsewhere results are very good, and the average of 1.27 is a pretty good score for a non-IPS panel. Here’s the Spyder’s own rating, just for fun. I’d say that this is a pretty strong monitor, despite its gray ramp and colour uniformity flaws. Colour accuracy is the test that I personally put the most stock into, and a good result here means a lot. Again, these results aren’t perfect, but for a gaming and office-work-focused monitor they’re not bad either. All in all, I’m pretty happy with the EX3200R. It’s probably the biggest 1080p gaming monitor (i.e. not a TV) on the market, and combined with its curvature it provides an immersive experience. The high refresh rate makes it ideal for racing or shooter games, and a strong contrast ratio helps for dark games or watching shows set at night. However, it’s not a good choice for multi-tasking, thanks to its low resolution. You’d be better off with either a 21:9 ultra-widescreen or a 1440p monitor for most tasks. Gamers who have invested in high-end PCs will also have an excess of horsepower, making higher resolution screens (e.g. 1440p or 4K) a better choice overall. Thanks for checking out the review; if you’re interested in the monitor you can find the latest Amazon prices listed below. Peace!